No matter the time of day, Nandana (Sanskrit for “paradise”) is an ideal place to gather with friends who appreciate faultless taste—and endless views of sea and sky. 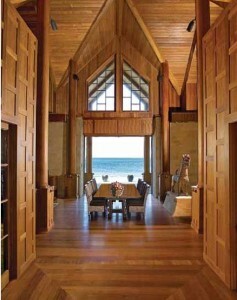 Nandana’s living room (above right) centers on a low-sitting Balinese table and deep daybeds covered in Thompson silks. The couple made several trips to Thailand, Cambodia, and Vietnam to purchase items for Nandana, including the Cambodian temple chimera figure that sepa- rates the living and dining rooms. Meals served at the dining room’s Indonesian table (or on the patio or beach) tend toward services and Asian-style salads, though menus are entirely at guests’ discretion. 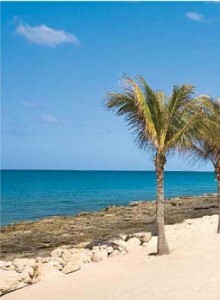 Massages and other treatments are administered in a spa room, which is adjacent to a fitness area and yoga terrace. In addition to spa, pool, and beach activities, diversions at Nandana range from excursions in the property’s sport-fishing yacht and tender (both with private guide) to rides on its ATVs and bicycles. Nestled among palm trees on either side of the main building, the two 1,000-square-foot Pavilion Suites open onto private patios with thick-cushioned loungers over- looking the sea. 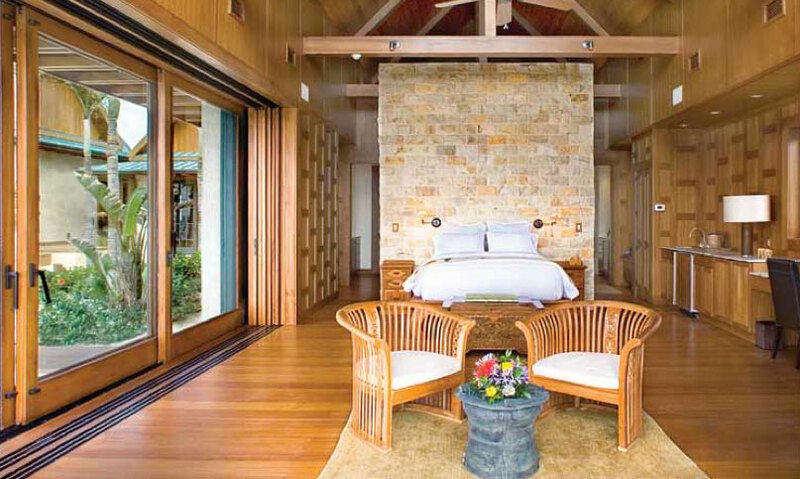 In a nod to the Jim Thompson House, teak (purchased by the owners in Myanmar) covers the suites’ floors, walls, and ceilings, the lat- ter of which slant upward in traditional Thai style. 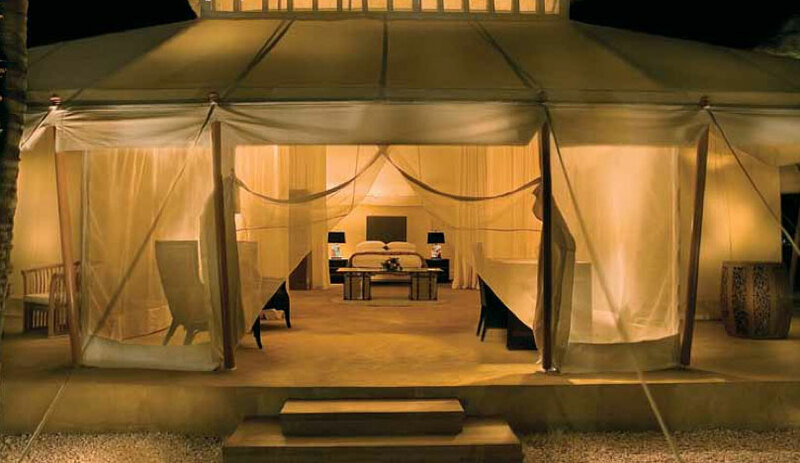 Panes in the ceilings allow guests to view stars at night while tucked beneath Frette linens in the pedestal beds. Decoration in the four bungalows (two slightly smaller suites are set back from the beach) is kept at a minimum, the better to highlight water, palm fronds, and sky. In one of the Pavilion Suites’ sprawling bathrooms (left), a white orchid drapes over a marble countertop. Both master bathrooms feature indoor-outdoor showers inlaid with river stones that massage your feet as you bathe. Here, as elsewhere at Nandana, the faucets and lights turn off gradually, so that nothing jars or intrudes on the serenity of the place. Situated alongside a canal, this 2,000- square-foot canvas structure includes a roomy sitting area and a bath separated from the bedroom by a cotton partition. 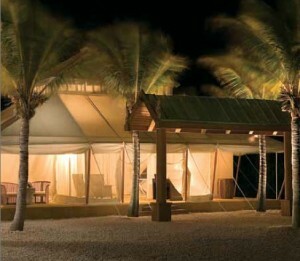 In addition to providing accommodations for an additional couple, the tented suite offers an alternative sense of place: Set across a private gravel road from the main building, the isolated outpost conjures savannah rather than lush tropics. Whatever your pleasure,a stay at Nandana ensures an experience of quiet luxury amid surroundings of exquisite taste.